This shop has been compensated by Collective Bias, Inc. and its advertiser. All opinions are mine alone. #InsideOutMovieNight #CollectiveBias. Inside Out party or movie night ideas. We love having movie nights at home with our kids, and this weekend added a few friends and watched Inside Out. Have you seen it? When it came out on DVD and BluRay this week I picked it up while I was at Target,and it was totally easy to grab with several snacks for our movie night too. Plus, the DVD/Blu-Ray at Target has 20 minutes of bonus features. 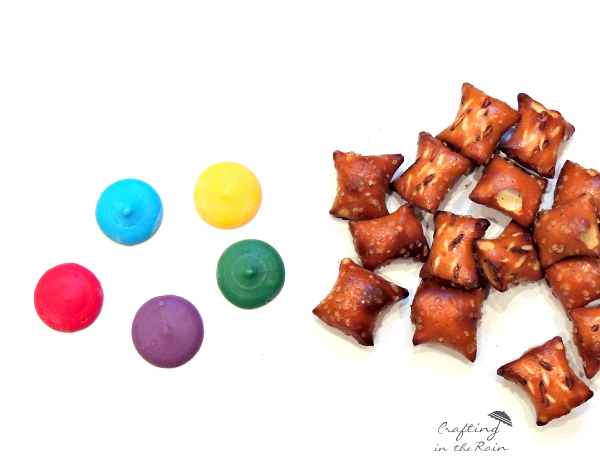 Dipping the Peanut Butter pretzel bites into colored candy melts, I made bags of Mixed Emotions for everyone. Aren’t they cute? 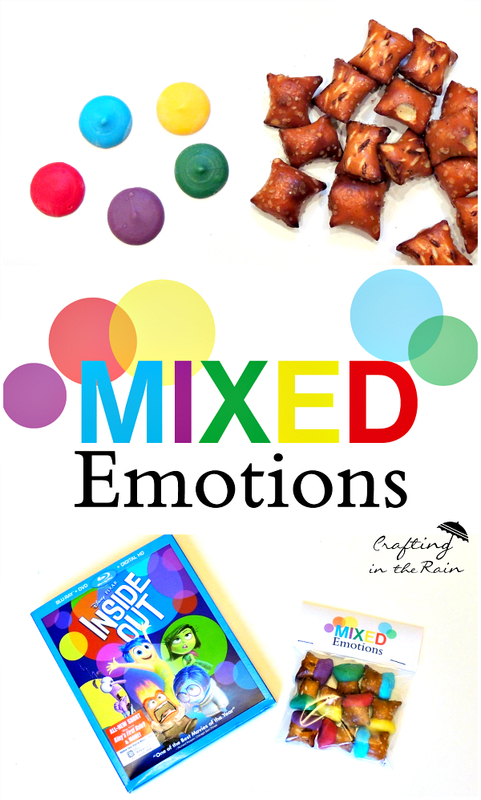 Each one of the colors matches one of the emotions in the movie: red for Anger, green for Disgust, blue for Sadness, purple for Fear and yellow for Joy. 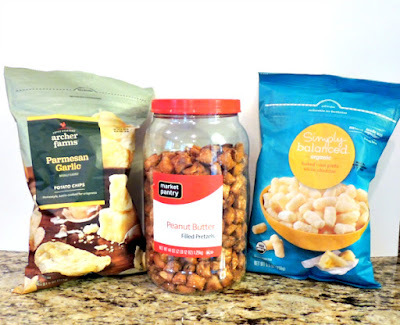 Download the printable tags, cut out, and staple them over the top of plastic bags. I also made an Inside Out game where we try to guess the emotion/ character. Print out and cut up the sheet of phrases and make 5 colored gems (glass pieces with colored paper glued on the back side.) Download the phrases for the game. To play, each person takes a phrase and picks out a colored gem from a bag so no one else can see what color it is (then put it bag in the bag). Then say the phrase using that emotion and everyone else guesses who they are. It can get pretty funny, especially if you’ve got little kids to play with. 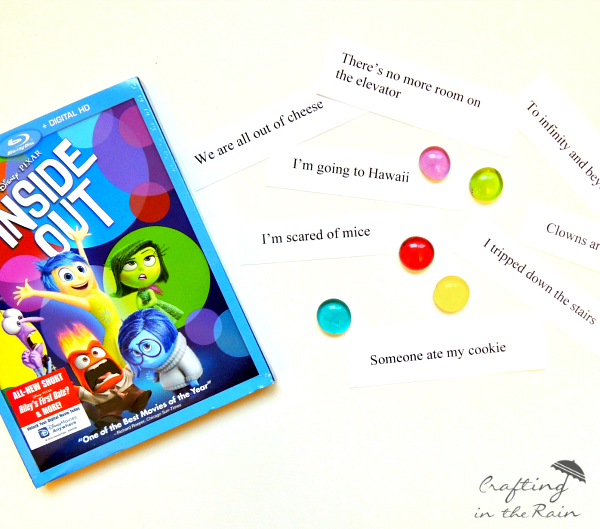 We really liked Inside Out, and it gives us a fun way to talk about what we’re feeling, how decisions shouldn’t be made out of anger, and I like asking my kids what “Islands” they think they have. I like to hear what’s important to them right now. If you’ve seen Inside Out, I’d love to hear who’s your favorite character? (I’m of course quite fond of all the mom-emotions.) 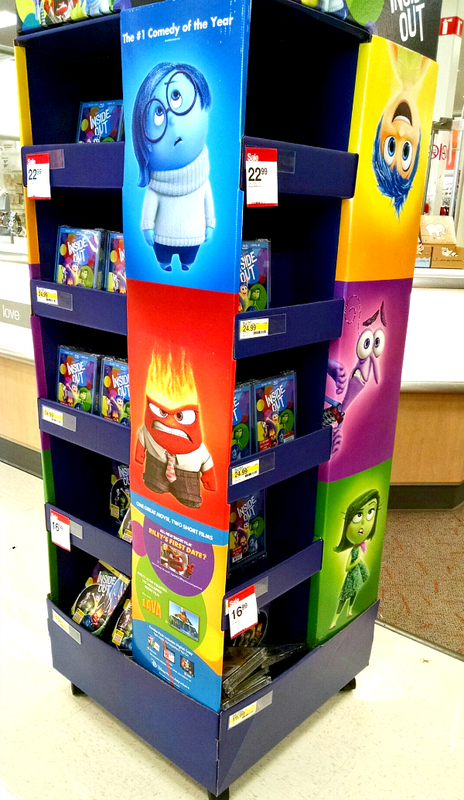 And you now have a couple of extra good ideas to add to your Inside Out movie night with family or friends. Enjoy! I haven't seen the movie but this sounds like a fun game. We loved Inside Out! We saw it at the drive in, but I am definitely buying the movie. Cute game! The game sounds really fun. We really loved this movie. I haven't seen the movie but I am so glad to hear it's out now. Going to go pick it up to watch with the kids! This game looks super fun. A winning combination!